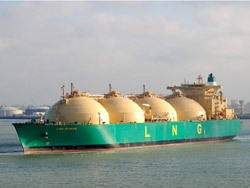 For the world wide transport of natural gas a large number of massive LNG tankers are used. For their propulsion and for their internal energy needs, these tankers use the gas that they are transporting. For the power generation steam turbine driven generators are used. On a large LNG tanker one of the turbine generators sometimes suddenly produced very high vibration till far above the first alarm level close to the trip value of the turbine. Despite various checks and inspections performed by the manufacturer as well as other concerned parties, on as well the turbine as the generator no cause was found. The whole steam turbine generator set-up is protected with only one proximity probe on the non driving end of the turbine. 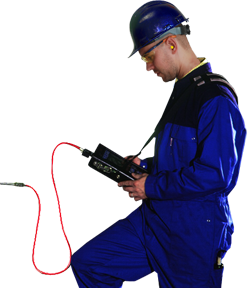 Earlier housing vibration measurement performed by another service company did not detect any high vibrations and pointed out the generator as the source of the highest vibration. In order to at last, find the actual cause of the vibrations van Geffen VMS was asked to perform a full vibration investigation on the complete machine train, using our 32-channel full transient measurement system. An additional problem to this investigation was that the vessel was only available for 18 hours for the measurements. 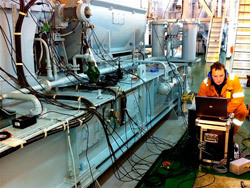 In this short timeframe the turbine, gearbox and the generator were retrofitted with over 25 proximity probes and accelerometers, a measurement program was carried trough, and the whole measurement system was dismounted again. Only after 7 hours of measurements with various load changes the high vibrations occurred. Due to the continuous and simultaneous recording of all transient channels we were able to capture the phenomena coming into existence. Something that would not have been possible with less advanced measurement equipment. An extensive analysis of the measurement data later indisputably showed that instability on the turbine bearing was causing the high vibrations. It was only during one specific load case that all circumstances were exactly right for this, for many years illusive event to occur. A small adaption in the turbine control system was sufficient to prevent the instability for occurring.